I sound like a cracked record going round and round, but again this week the pencil did not hit paper very much. Below is my entire output, a practice for getting the colours right! And now I think the Foxgloves are past their best so I might have to wait until next year to have another go. But on the positive side, I have had another go at the photography lark and think I have now solved the problem of photographing paper to my satisfaction. The solution was in the exposure. My paper now looks ‘white (ish)’ instead of dingey greyish. So I am happy about that and can let it go……….. 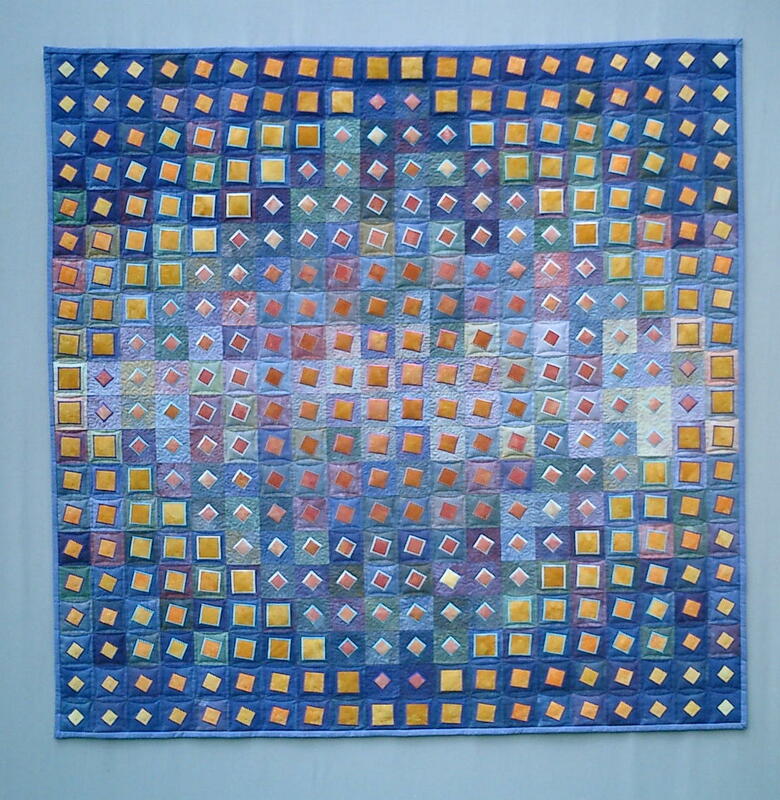 I have been following the blog of occasionalartist over the past weeks and have been very interested in the work she is doing with paper and sewing and they reminded me of the last quilt I made just in the square shapes coming off a flat surface and the shadows and dimensions that are created. Materials used: plain white fabric, coloured threads applied with overlocker, and plastic tags (the type that hold labels onto clothes that get cut off and thrown away). There is no other valid reason for drawing than the awareness of the eye awakening from its half-sleep. When I draw in line with a pen or a sharp pencil I am compelled to the most intense, uninterrupted attention to and awareness of what my eye perceives. It makes it impossible to deceive, to humour or to flatter myself. The quality of my line shows up every attempt at a cover-up, a pretense. Looking at my drawing once it is finished, I can’t help becoming my own graphologist: I see instantly every flagging of my concentration, every incompetence, every trick! This entry was posted in art, Draws Shoots and Leaves, plants and tagged awakened eye, drawing, foxglove, Frederick Franck, photography, quilt, squares, wittgenstein, zen on June 8, 2014 by Draws Shoots and Leaves. Orange! A Marmite type of colour. 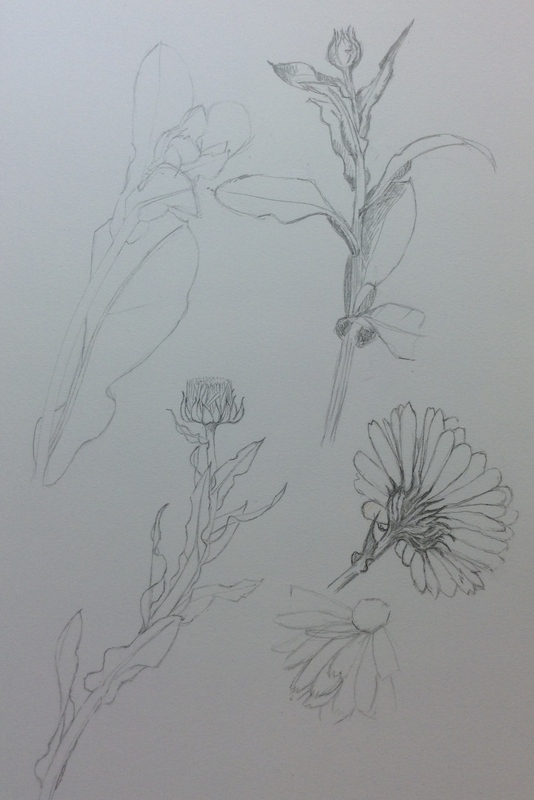 This week as I wandered around the garden wondering what to draw, mulling over my skills, I realised that I had been avoiding flowers with too many petals. Too hard, too complicated – nah not for me, I can’t do that yet. Despite my doubts I left the garden with a marigold in my hand, and decided to give it a go. 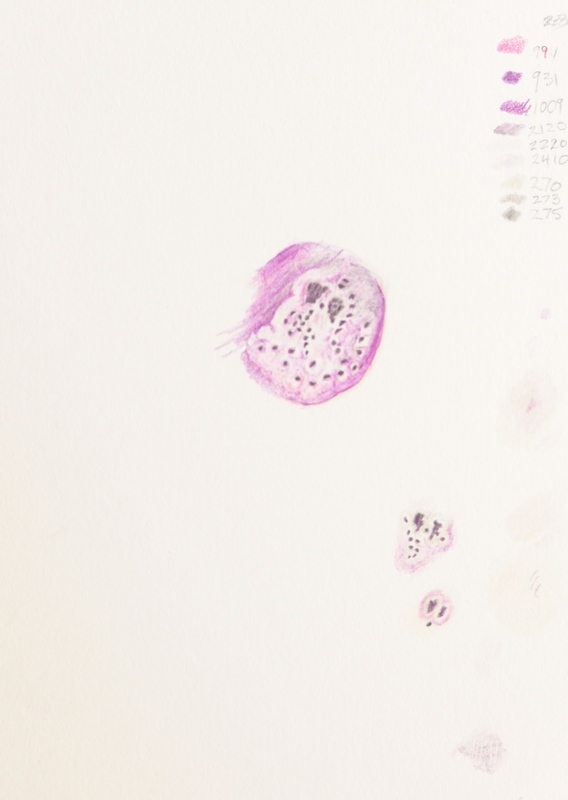 As I sat down and started drawing in dawned on me that it was not the shape or the number of petals that was going to be the problem but the colour. What a bright orange, what a singeing eye popping colour, it really does not look like a natural colour – it is just way too bright. 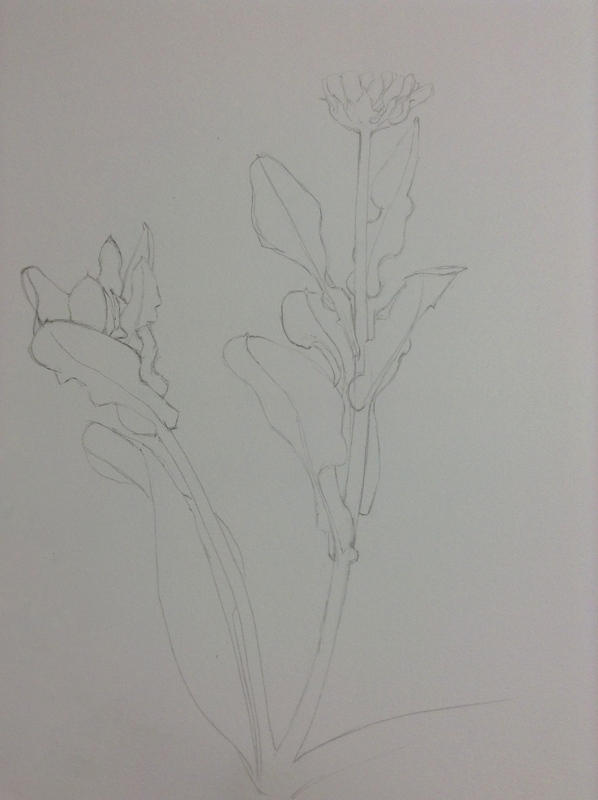 Back at the drawing board, I was struggling with both the colour and the shape of the marigolds and now that I have finished a few and photographed them and looked with new eye I can see how wobbly they are and how very ‘off’ I am in places and how I have failed to match the orange. 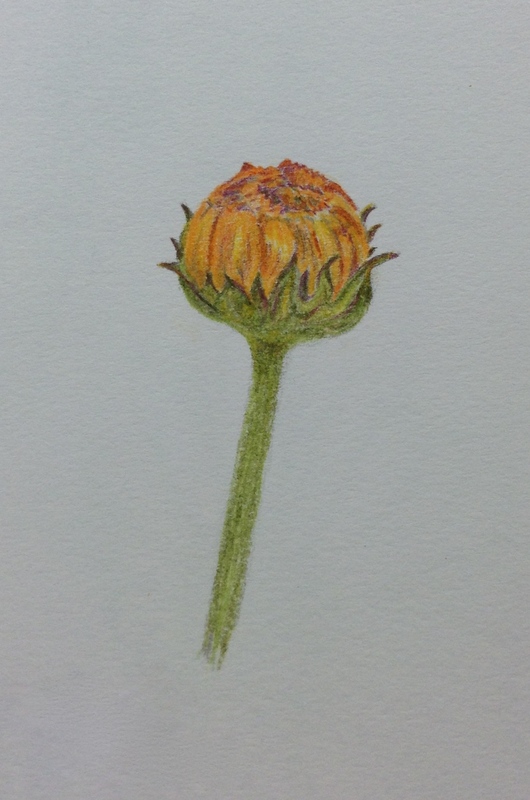 So although not satisfied at all with my coloured pencil efforts, I really enjoyed the pencil drawing, a marigold when studied closely has a complicated and interesting shape, the leaves wrap around the stalk and they twist and spiral outwards. The bud is tightly wrapped with a calyx with spikes that curl beautifully. 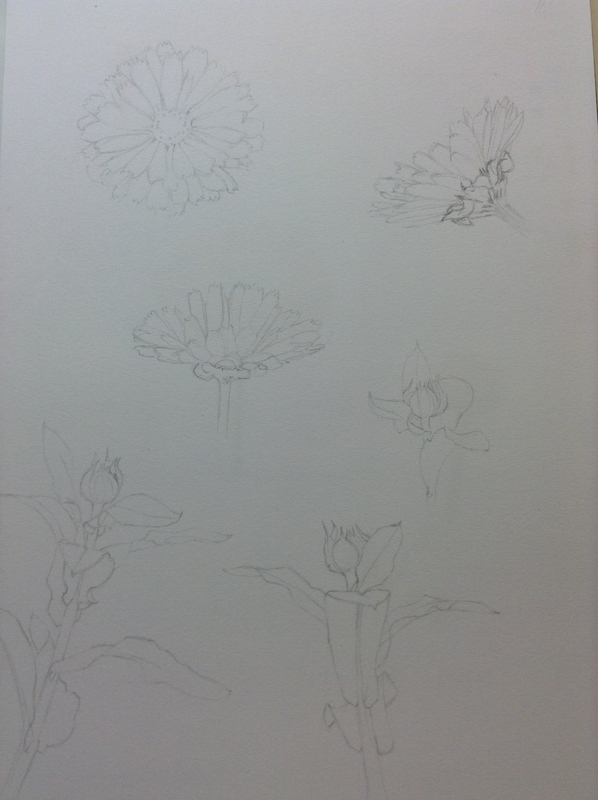 I found the structure fascinating and a real challenge to draw. 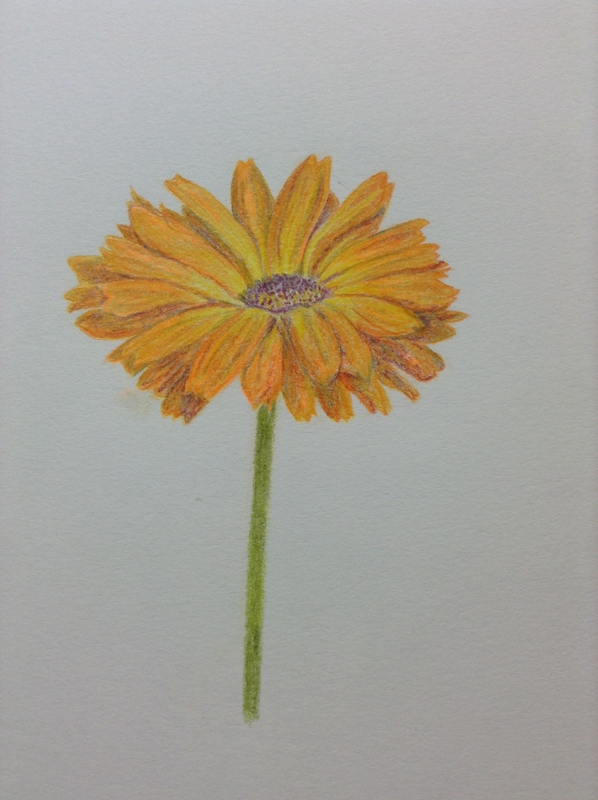 This entry was posted in art, Draws Shoots and Leaves, garden, plants and tagged coloured pencils, drawing, marigold, marmite, quilt on May 3, 2014 by Draws Shoots and Leaves. 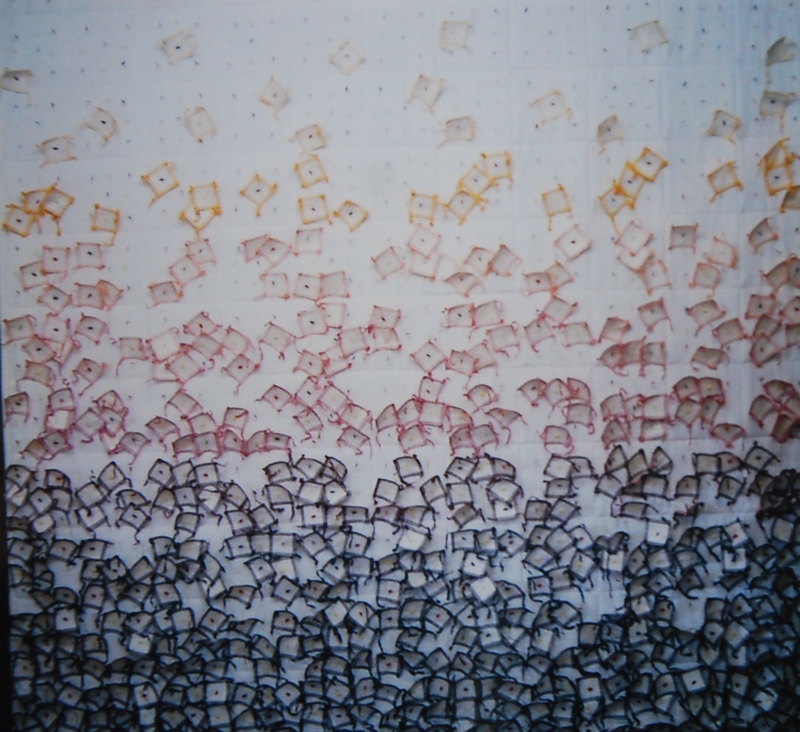 In my last post I confessed to enjoying the process of colouring in little squares of paper and shuffling them about and arranging them in groups . 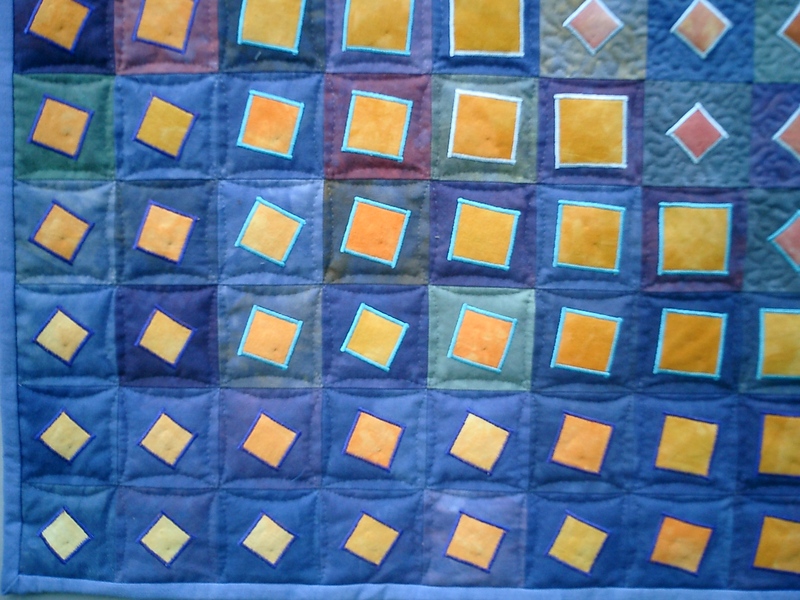 Well, time for a confession here, I am a recovering quilt maker so I spent many happy hours messing about with squares (fabric rather than paper). All the colours were hand dyed by me and the design was drawn up using a drawing programme on the computer. Many hours were spent rearranging the colours into harmonising or contrasting heaps. 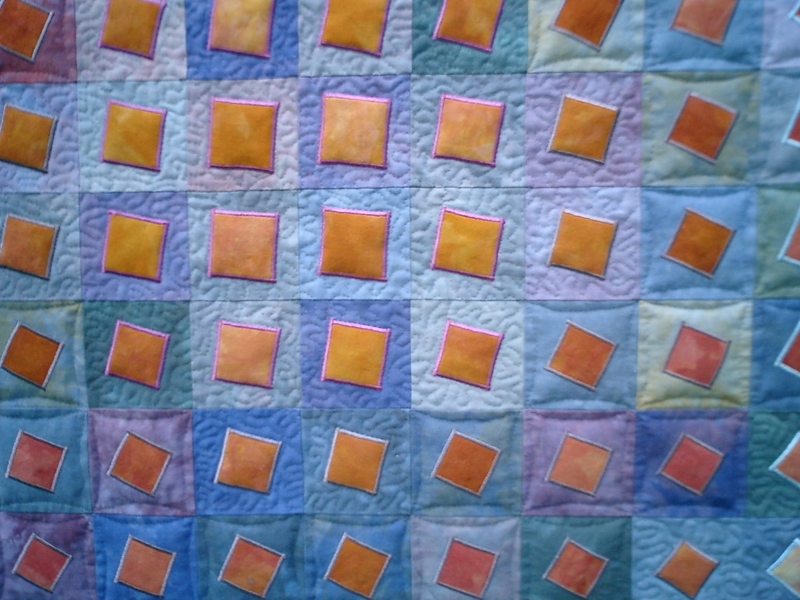 So you can see here, why I enjoyed playing with squares of colour. 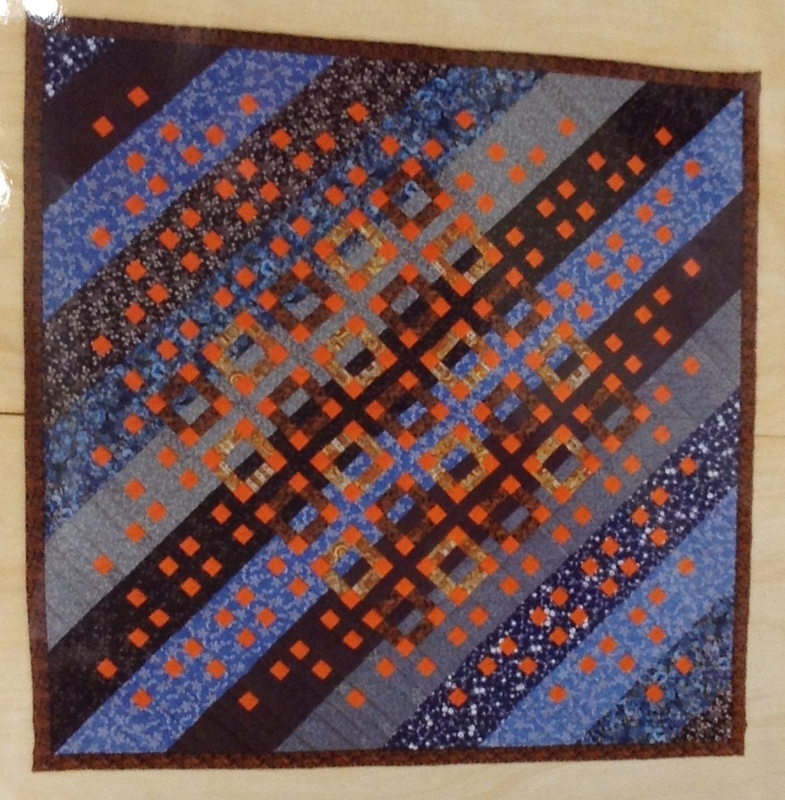 This entry was posted in art, craft, Making, Materials, technique and tagged color, colour, dyeing, quilt, quilts, squares on February 3, 2014 by Draws Shoots and Leaves.